In the NBA as much as any other professional sports league, a player's worth is determined by their performance in the postseason. Averaged 30 points during the regular season? So what, he choked in the playoffs. Nine-time All-Star? Big whoop, he never won a ring. It's harsh, but often stardom goes hand-in-hand with playoff success. However, everyone has to start somewhere. Last year we watched Utah Jazz guard Donovan Mitchell grow up before our very eyes as he led his team to a first-round upset of the Oklahoma City Thunder before another valiant effort in a series loss to the Houston Rockets. Dwyane Wade was just a promising rookie before leading the Miami Heat in scoring and assists during a trip to the Eastern Conference semifinals in 2004, setting the stage for a legendary career. The playoffs can help propel careers into stardom, and here are seven players who could experience such a breakout this postseason. Russell made his first All-Star Game this season, but his full impact on the Nets may be lost on the larger NBA audience across the world. 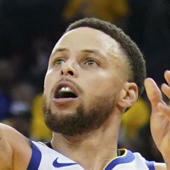 Russell is among the league's best in clutch situations (a five-point game or fewer with five minutes remaining), averaging 3.1 points per game in those situations, according to NBA.com -- on par with All-Stars Damian Lillard and Paul George. In what should be an exciting opening-round series against the 76ers, Russell will be able to put his full talents on display, and could have a breakout moment if he leads his team to a win with one of his spectacular fourth-quarter performances. Like Russell, Murray will be making his playoff debut and -- also like Russell -- he's capable of stretches where he's practically unguardable. He's still inconsistent, to be sure, but Murray put up seven games of 30 points or more this season, including a career-high 48 in November and 46 a month later. With Will Barton and Gary Harris struggling to score and Nikola Jokic's preference to facilitate, Murray could be looking at some high-usage nights as he tries to prevent the Nuggets from being upset. A longtime favorite of the NBA nerd mafia, Siakam will likely win the league's Most Improved Player award after going from a solid role player to a crucial component to the Raptors' success. His length, motor and versatility make him an absolute delight to watch on both ends of the court, and he's transformed his shooting from a weakness to a strength in rapid fashion. He's capable of putting up big numbers, scoring over 30 points in five games this season, including a 44-point performance in just 32 minutes against the Wizards in February. The Raptors already have star power in Kyle Lowry, Kawhi Leonard and Marc Gasol, but some fans will likely shake their head in amazement at some of the things Siakam does on the floor. Gordon's scoring is down a bit from last year, but Magic coach Steve Clifford has said that this is Gordon's best year as a pro thus far. His field goal percentage (45 percent) and 3-point percentage (35 percent) are both up this season, and his assist total has nearly doubled. The emergence of Nikola Vucevic has taken some offensive pressure off of Gordon, and he's become more of a facilitator. Milwaukee will force the Magic to play at a faster pace than they're used to, and we all know how well Gordon can finish above the rim in transition. If he gets hot from the 3-point line for a few games, Gordon could have a great series for Orlando. After being rewarded with a four-year, $72 million extension before the season, Turner put together his best year yet in his fourth NBA season. His scoring and rebounding remained steady, but he led the league in blocks (2.7 per game) and increased his efficiency with career-highs in field goal percentage (49 percent) and 3-point percentage (39 percent). He played particularly well in three games against the Celtics this season, averaging 14.0 points, 8.0 rebounds and 1.0 blocks per game in just under 30 minutes, shooting 52 percent from the field and making 5-of-8 from beyond the arc. Turner is capable of being a menace on both sides of the floor, and he'll get his chance to show that against a familiar opponent. The second part of Indiana's one-two punch at center, Sabonis also had a career year and has garnered some well-deserved Sixth Man of the Year buzz. The Celtics generally have trouble with big men, and Sabonis is no exception. He averaged 13.8 points, 7.5 rebounds and 4.0 assists in just under 25 minutes in four games against Boston this season, and shot 60 percent from the floor. Lineups with Turner and Sabonis together have been successful in limited minutes for the Pacers this season (the unit of Darren Collison, Wesley Matthews, Bojan Bogdanovic, Turner and Sabonis had an offensive rating of 109.0 in 38 minutes), so we might see more of that against the Celtics. In the postseason Nate McMillan will ride the hot hand, so expect Sabonis' minute total -- and production -- to increase. As a rookie, Gilgeous-Alexander has played with a maturity well beyond his years, and that will serve him well in his first playoff experience. Nobody's expecting him to go out and average 20 points against the Warriors defense, but he will start and play a prominent role for a Clippers team that will impress viewers with how hard and cohesively they play. Gilgeous-Alexander is long and smooth, and has a great mid-range pull-up game and gets after it on the defensive end. Even if the Clippers get swept, he'll likely leave some people with the feeling that SGA will be a star before too long.